Independent Transport Videos are proud to present this archive video presentation of the iconic AEC Routemaster bus running in service on it’s home territory - London. The video was shot by transport photographer Malcolm King in the late 1980s and early 1990s and features the Routemasters running in service in and around the capital. The programme starts in north London where we make visits to Archway, Holloway and Finchley. We see the Routemasters in service and emerging from Holloway garage along with the contemporary buses of the day in the shape of Metrobuses and Leyland Titans. We then head to central London. At Hyde Park Corner we see open top RMs and closed top RCLs operating ‘The London Transport Sightseeing Tour’ along with regular Routemasters in service and buses from the DMS class. A ride on an RM takes us to Whitehall to see the action on this busy thoroughfare. Malcolm then visits Battersea garage, home to the Routemaster sightseeing fleet and London Coaches. Stamford Brook garage is our next location before returning to central London and Parliament Square to see the sightseeing vehicles in action, which includes an RMA and former Northern General Routemasters converted to open top. There are plenty of standard RMs and RMLs as well as Metrobuses and new ECW bodied Leyland Olympians. We then visit Fulwell garage to see lines of delicenced RMs awaiting their fate. There is a show on at Covent Garden, were we see the one and only rear engined Routemaster, FRM1 (KGY 4D). Malcolm then moves onto the streets around St Paul’s Cathedral to film the action there. We see amongst others, RMCs on the 15 service in a smart livery with gold trim, which are also filmed later by the Tower of London. Back in central London we visit Oxford Street and then ride by Routemaster to Victoria bus station. Look out for RM1590 (590 CLT) in ‘General’ livery amongst the hustle and bustle of this busy area. After a brief call at Euston, Malcolm returns to central London on a hot summer’s day, and we see RM53 (VLT 53) overheating in Fulham Broadway, with passengers having to transfer to other Routemasters! Its then back to Whitehall, Trafalgar Square and Victoria with the final scenes on this programme being a return to Whitehall and Parliament Square. 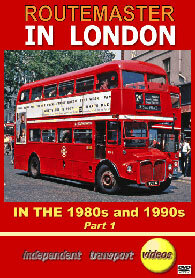 It is all non-stop action, Routemasters from all angles as well as visiting coaches, sightseeing buses from competing companies and a wide variety of London buses from this interesting period in the history of the London bus. …. So take your seat and enjoy this nostalgic video presentation featuring the iconic Routemaster running in service in its natural home of London! Duration : 88 minutes (approx).